What to do when your trap gets a HIT (a potential catch)? A fresh crop of bees converging on a swarm trap. I have been conversing back and forth with someone on YouTube about swarm trapping. Recently they had a trap that was occupied. They immediately attempted to hive the bees, and they fear that something may have gone very wrong. This is a failure on my part, because I have not yet communicated the entire procedure that I am using for swarm trapping. It is time for me to cover the next step: You are sure bees have settled into your trap. First off do nothing other than observe them. When they arrive there is a large amount of excitement along with a very loud buzzing emanating from the trap. It is a great thing to witness, but not the time to take any action. If you have’t read it yet please review The difference between a HIT and a catch. You need to make sure you have a catch prior to doing anything or you will just be wasting time. It is only after several days when field bees are bringing in pollen that anything should be done. Just Let M Bee until then! At that time the likelihood for eggs or brood being present helps to increase the odds that the bees will not leave even if you shake things up a little by moving them. Prior to moving time be thinking about location. If you capture them within two miles of your apiary you need to take steps to avoid a major mishap. Please take a look at Michael Bush’s site. Along with many other aspects of beekeeping he has a very informative entry on moving bees that should be read prior to doing anything with your trap. If they are moved less than two miles from the TRAP SITE to your apiary the foragers may return to the TRAP SITE. Since the trap will no longer be there they will be lost and you may potentially lose thousands of foragers as well as all of the nectar and pollen they could have provided. A loss of that many bees and forage could be the end of your new colony so don’t skip the reading. Mr. Bush has ideas on how to overcome this 2 mile rule that I have used with success. From this point on I will assume you have read the link about moving bees. Close the trap up either after dark or before light. That way all of the colony is at home and you don’t lose any foragers. Get a spray bottle and put some water in it. If even in the dark the front of the trap has bees on it spray it GENTLY with a little water. They will go inside and you can shut them in by whatever closure device you are using. You then need to remove the trap and get it to your apiary if within walking distance, OR to a means of transport. Be very careful when walking with your loaded trap to NOT allow the frames to swing. I call this clacking because of the sound the frames make when they “clack” against one another. If your frames clack bees will be injured or killed. The way that I prevent this is to carry the trap with one of the 16-1/4 faces against my chest while holding it level in front of me. If carried the other way (19-7/8 faces against your chest) it is VERY hard to prevent clacking. Try it with an empty trap or just a deep hive body with frames in it. You will know the sound of clacking. If you are transporting this thing with a vehicle there is yet another consideration. The frames must be oriented in the vehicle so that they run parallel with the road. That way the frames will not swing in the vehicle when you start and stop. When you reach your ultimate desalinization set the trap on the hive stand. Then open the closure device. I will normally allow them to fly for a couple of days prior to hiving them unless weather or my work schedule do not allow it. Later this week I will be discussing HIVING A SWARM TRAP. Check back in. 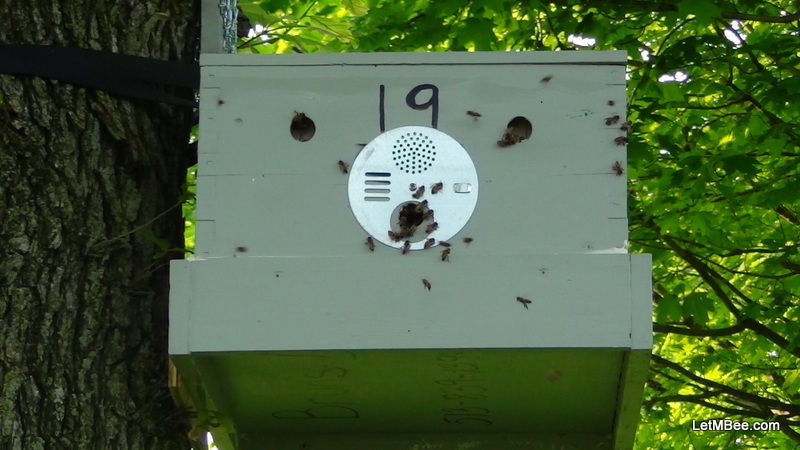 This entry was posted in HowTo, Swarm Trapping, Uncategorized and tagged bait hive, bee, beekeeping, feral bees, Indiana beekepeing, Jason Bruns, moving a swarm trap, swarm trap, swarm trapping. Bookmark the permalink. 6 Responses to What to do when your trap gets a HIT (a potential catch)? That water spray thing is a good idea, I had to move boxs with clumps of bees on them before, had to screen off the whole front lol. I wish I could say that it was mine originally. I got it from Langstroth on the Hive and the Honeybee. The Ole Reverend used to use a sprinkling can in order to get his bees to go in when he wanted. If you haven’t read it I recommend it. That and Huber’s book which Langstroth references many times are a must for any naturalist beekeeper. Both can be found on line for free. Langstroth’s book can actually be found in audiobook format on Librivox.org. You can get it in ITunes as well. Check it out. You will pick up ideas from it. It doesn’t take much water, and you don’t have to drench em’. Thanks for these tips. I have a trap in a tree with 8 frames loaded with bees. Will be moving them this weekend. My first trap capture! That is awesome. Welcome to swarm trapping. There is a video from last year on my YouTube channel of me doing some hiving. I have some raw footage I hope to get up within the next two days of one I did this year. I am getting better at it!!! It is only taking about half the time this year. I am also using 8 frames in some of my traps. It is working WAY better than 5. Even having six in the smaller traps is better than 5 frames. I have only had one colony stick comb to the roof of a trap this year. I hate it when they do that. It makes the transfer a lot more messy. I will have that video up before the weekend. Watch it before you make your transfer. If you have any questions don’t hesitate to ask. If you have enough wooden-ware and frames get that trap back up. The smells in there will be a strong attractant for another swarm. Good luck. I will be trying this with a small 24in top bar hive for my first time made the topbar box on the small side for transport purposes wonder if the bees will try to get into the attic of the top bar i guess i need to screen the eaves off/ suggestions? I am not sure what your design looks like. Try to control where the bees can go. If they can get into a place there will be comb and or propolis in those places. Send a link to a picture and I will take a look. The other thing is heck give it a try. I have learned my best lessons by trying something only to find out WHAT NOT TO DO. It only takes going out in such a hurry you don’t tuck your shirt in, ONCE. After that you take your time. I have entrances that I both love and hate. I haven’t written about them because they are a work in progress. That process is teaching me a lot.